What’s New About a “New Normal”? 1. Adam Shell, “’New Normal’ Argues for Investor Caution,” USA Today, August, 16, 2010. The term “new normal” originally referred to a post-global financial crisis environment characterized by several years of sluggish economic growth, below-average equity returns in developed markets, high market volatility and risk, high unemployment, and a world in which the range of possible financial outcomes is wider than normal and wealth dynamics are moving from developed to emerging economies. 2. 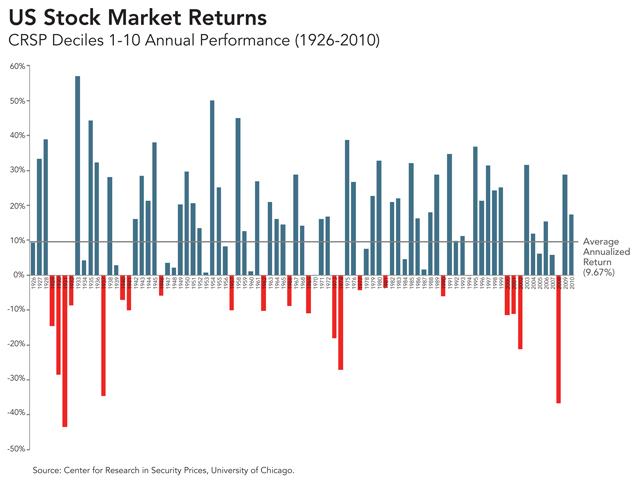 Returns for all periods of the CRSP 1-10 Index are annualized. Data provided by the Center for Research in Securities Prices, University of Chicago. Data includes indices of securities in each decile as well as other segments of NYSE securities (plus AMEX equivalents since July 1962 and NASDAQ equivalents since 1973). Additionally, includes US Treasury constant maturity indices. Dimensional Fund Advisors LP is an investment advisor registered with the Securities and Exchange Commission. This information is for educational purposes only and should not be considered investment advice or an offer of any security for sale.